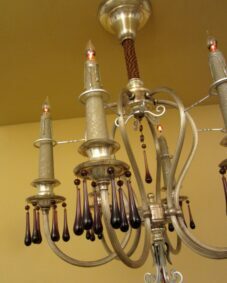 I’m very pleased to offer this lovely 1920s silver-plated 5-arm chandelier! The chandelier is not yet restored yet. It will be fully rewired, and the exposed wire will be cloth-covered like the original. The original chain has lost its plating; I will burnish this silver. 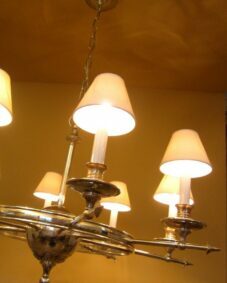 The silver-plate has a bit of a patina; I planned on leaving this unless you prefer the chandelier polished bright. Please note that the stem, and the scalloped bowl on the bottom, will not likely polish bright (they are of a different metal than the rest and the silver has aged differently on these two components; see images). The fixture has many lovely details. I love the sweeping arms. Indeed, the whole has a subtle elegance. 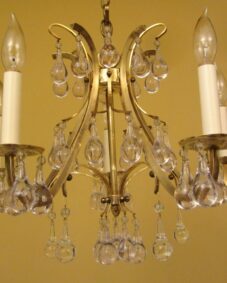 While originally intended for a living/dining room, today I can envision the chandelier in a new spa bathroom! 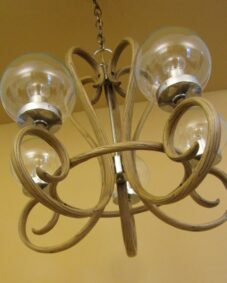 This chandelier will be shipped wholly restored and with new sockets and wiring, ready to hang, and with all the mounting hardware needed! Sadly, the silk shades are not included. 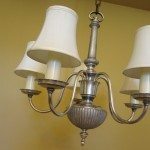 Happily, they are commonly available from in places like Home Depot, Restoration Hardware, and Pottery Barn (the latter two on-line even). 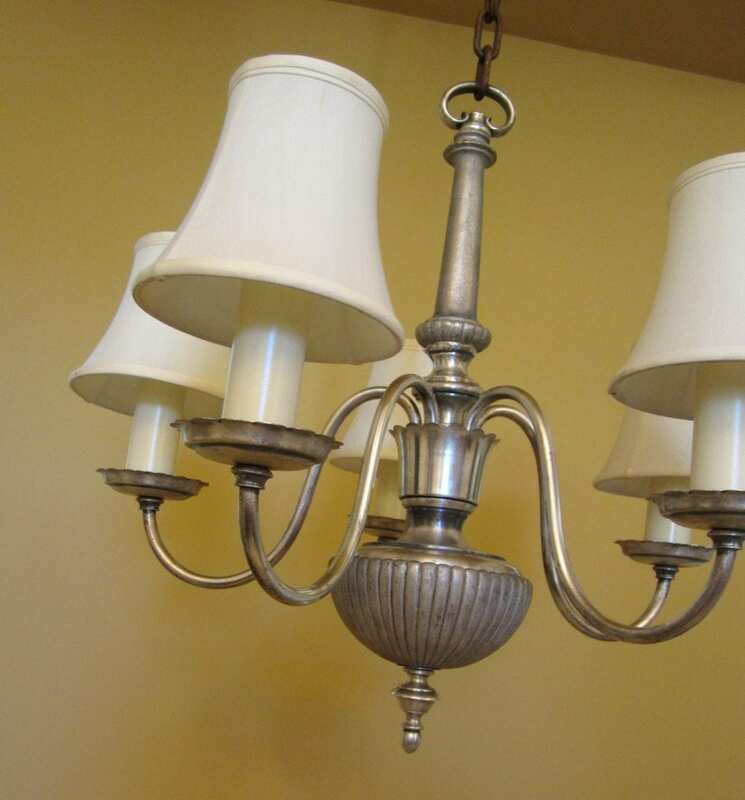 SIZE: The fixture hangs down about 38-inches and is 18-inches wide (20-wide with shades). I can remove up to 14-inches of chain; I can add chain. The only issue is minor. Under the cast stem is a small stamped metal piece. This has a stress crack. This is not readily obvious. The original chain will be burnished silver. The silver-plate looks very good. As noted above, on two components the silver looks a bit duller (see images, too); this will not polish out. I don’t think this is unattractive.